Our unique system starts with 100% human hair from Europe. 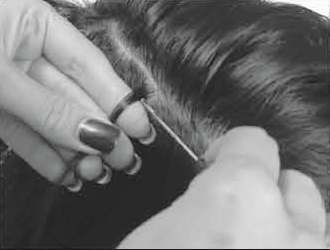 The hair is applied using a simple, unique method by a certified stylist. 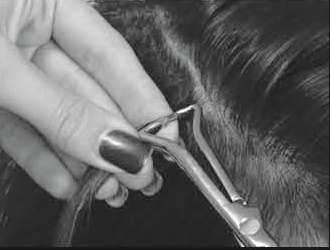 Unlike other methods, the process uses no braiding, sewing, heat or glue and is safe and painless to apply. Simply section, thread and secure; removal is fast, easy and safe! Q: Will it damage your natural hair? A: With our unique system, there is no tension, stretching, chemicals or heat used during the application or the take down process. Our unique system provides the safest extensions available today. Q: Will the hair match your color and texture? A: Absolutely! We can match your color and texture perfectly. Custom blending is our specialty! Q: How do you care for your extensions? A: With our unique system, you can color, perm and style your hair like normal. Even use your favorite tools like flat irons and hot curlers. A: With regular maintenance, the life of your extensions is up to you. 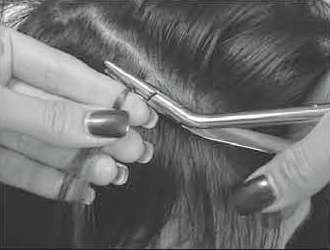 Most people can go up to 3 months before needing any service on their hair and the hair is re-usable for years. A: With 4 different sizes and over 40 colors, our unique system blends naturally with your own hair...only you will know!